Founded in 1968, AVIMATIC s.r.l. is specialized in high precision mechanical processes based on Customers’ specific drawings, in small-medium size lots. 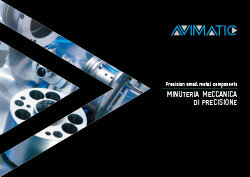 The attainment of increasingly high quality standards, extreme care for the needs of its Customers and continuous enhancement of its internal resources make AVIMATIC the right partner in the field of precision mechanics. Since its foundation, AVIMATIC has made the quality of its production a distinctive element recognized by its loyal clientele and it was among the first companies to certify its own system of quality management. Short selection of AVIMATIC’s production divided according to fields. From AVIMATIC’s experience and from the close collaboration with its Customers stem ideas that translate into innovative finished products. Here are some of the most noteworthy examples.